The Yadanabon Bridge” was built crossing Ayeyarwaddy and connects Mandalay with Sagaing. There are several places of interest in this Sagaing. There is ancient fortress, named “Thabyedan Fortress” which was built under King Mindon between 1874 and 1878 to defend against the British during the third Anglo-Burmese War. 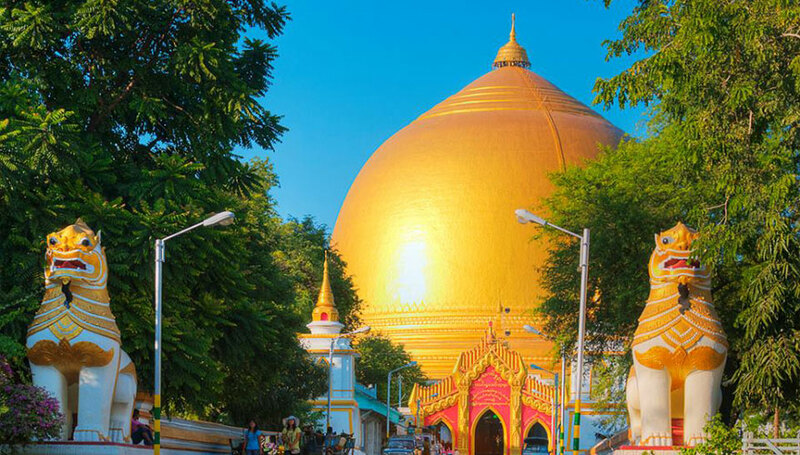 Then, “Kaungmudaw Pagoda” is known for its egg-shaped design, which stands out among more traditional –style, pyramid-shaped Burmese pagodas. Inwa is located across Myitnage River about 20km southwest of Mandalay is the capital of Burmese Kingdom for nearly 400 years. Its ancient capital is famous for “Nanmyint Watch Tower” and Teak-built Bagaya Monastery for its teak pillars amounting to 267 in total is still to be seen today. Visitors croos the river on a ferry and ride around the sites of Inwa in a horse-drawn cart. 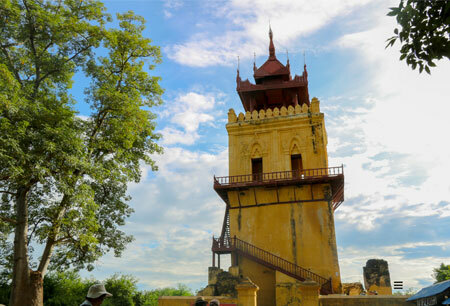 "The massive unfinished Mingun Pagoda” was built at the end of 18th century. Mingun is located across Ayeyarwaddy River about 12 km north of Mandalay. 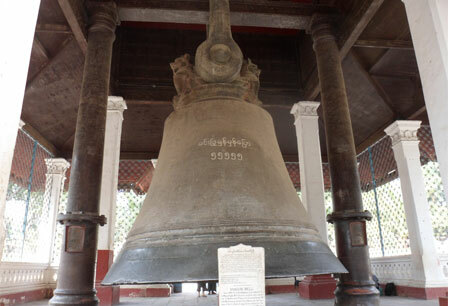 Measuring of Mingun Bell almost 4m high it is considered the largest ringing bell in the world which is the number 55555 is inscribed in Burmese script on the outside of the bell, 55555 being its weight in viss, that is about 90 tons. It is reached by ferryboats across the river and takes 1 hour for up-river and 40 minutes for down-river. A boat trip to Mingun is pleasant with plenty of life on the river to see. Tea leaf salad (To make the dish, the sour, slightly bitter leaves are mixed with shredded cabbage sliced tomatoes, nuts and peas, a splash of garlic oil and pungent slices of chili garlic. This dish can be a snack, an appetizer or coupled with a plate of rice). Nangyi thoke or Nangyi salad (Tourists will love to try dry noodle dishes. The dish takes the form of thick, round rice noodles with chicken, thin slices of fish cake, par-boiled bean sprouts and slices of hard-boiled egg. It is the most popular dish among tourists). Mohinga (This tempting dish is made from round rice noodles served in a hearty, herbal-based broth, often supplemented with the crunchy pith of the banana tree). In conclusion, Mandalay is the one of the destination for tourist attraction, Burma’s culture and religious center of Buddhism, having numerous monasteries and more than 700 pagodas. Mandalay is surrounded by good daytrip destinations and being relaxed for all visitors. 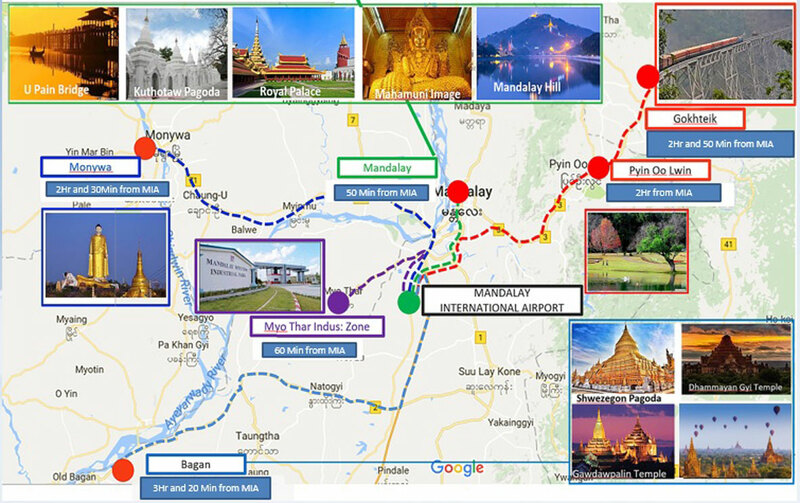 Therefore, we would like to recommend all visitors around the world to select trip to Mandalay to be wonderful and memorable place for your vacations.